Identity was on the agenda for the second instalment of the Cass essay competition. This year’s competition was titled #Change and invited students to write about how multiculturalism at Cass had influenced their views on their own identity. Out of the 30 entries to the competition, there were 24 nationalities and 14 courses represented. The essays were then shortlisted to nine before three winners were selected by a judging panel including, Professor Marianne Lewis, Dean of Cass, Professor Andre Spicer, Professor of Organisational Behaviour and Professor Stefan Haefliger, Professor of Strategic Management and Innovation. First prize went to third year student Federica Reale, (BSc Business Studies), whose essay included short stories describing how each person she met on her INTO course has helped shape her time at Cass. Second prize went to Colette Blake, (MSc Marketing, Strategy and Innovation) and Terence Obeng, (BSc Management), took third. Federica said: “Experiencing different cultures is something I enjoy, as I spent my last year of High School in America before returning to Italy and then coming to London to study at Cass. “I started at INTO City in a foundation year and that was really helpful when making international friends. These are the people I mentioned in my essay, as they have really shaped my time here. Although we are on separate courses at Cass, we have been on our journeys together. “Being in a new country and without my family in Italy meant I had no one to rely on, but the people I met at Cass and on my INTO course have now become part of my new family and I can go to them for anything. They have really shaped me as a person. 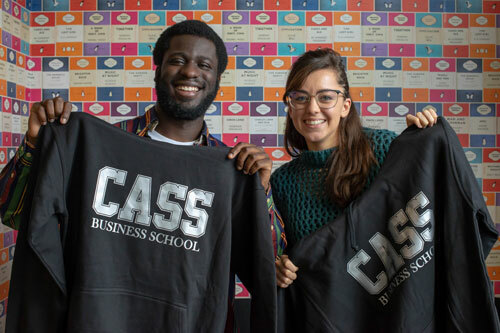 “Good businesses create global relationships with people across the world, this is echoed at Cass where we are always encouraged to do coursework or projects in teams with different kinds of people. “If you don’t have people from different backgrounds in business, then you lose out on that experience and can only go so far. “I entered this competition because I wanted to show how multiculturalism has enhanced my time at university.